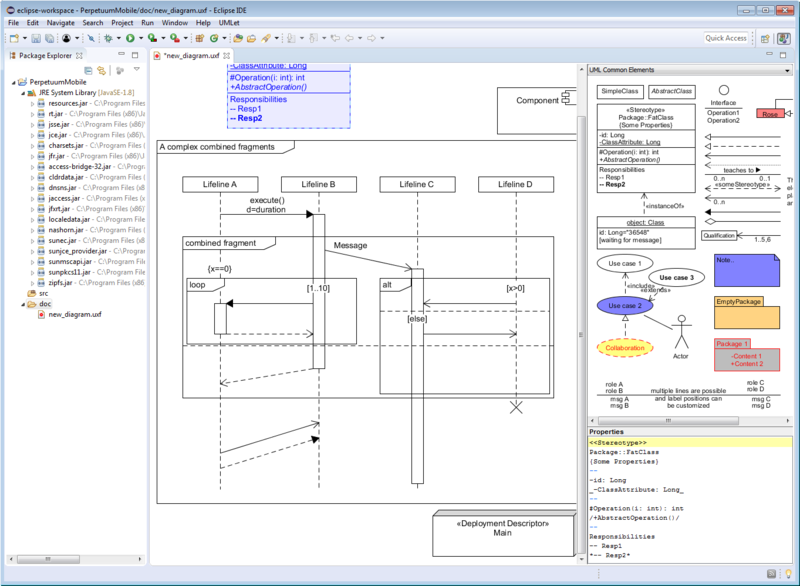 UMLet is a free, open-source UML tool with a simple user interface: draw UML diagrams fast, build sequence and activity diagrams from plain text, export diagrams to eps, pdf, jpg, svg, and clipboard, share diagrams using Eclipse, and create new, custom UML elements. UMLet runs stand-alone or as Eclipse plug-in on Windows, OS X and Linux. If you like UMLet, please star us on Eclipse Marketplace! Press Shift to avoid sticking relations! UMLet's design goals are also described in this paper and this one. Custom elements are described here. You can support this UML tool by linking to this site; by sending us feedback, bug reports, or blurbs we can quote; by giving us a star on Eclipse Marketplace; by spreading the word on social media; or via PayPal. Thank you - we truly appreciate it!